This plastic pot is made of environmental friendly PP, which will maintain its shape in any weather. Plastic plant pots are lightweighted, thin, soft but sturdy. They won't crack so easily. ❤️ NOBBEE's latest plastic plant pots are a little bit(2mm) shorter but thicker than before. Our new PP material is denser, glossier and unbreakable from falling. ❤️ These nursery pots are 3.5 inch across and 3 inch high, with good drainage holes in the bottom. Perfect size for cattis and succulents too. ❤️ As starter pots, they are sturdier and cheaper than peat pots. Durable plastic material makes them even reusable for seedling. ❤️ All little flower pots are painted brick red outside and deep brown inside, which give a look like pottery. Every pot can stand still. There are four "feet" at the bottom which make sure that fresh air can go through. ❤️ You will get 100 little plastic seedling pots each package at the price listed. They are easy to be stacked up and stored. If you have any questions about this product by NOBBEE, contact us by completing and submitting the form below. If you are looking for a specif part number, please include it with your message. 100 NEW 6 Inch TEKU Plastic Nursery Pots - Azalea Style ~ Pots ARE 6 Inch Round At the Top and 4.25 Inch Deep. 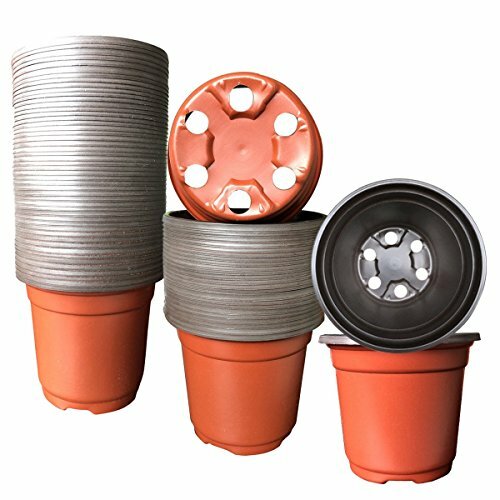 20 NEW 6 Inch Dillen Standard Plastic Nursery Pots ~ Pots ARE 6 Inch Round At the Top and 5.6 Inch Deep.